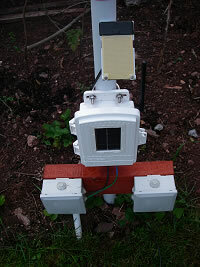 The weather station consists of a wireless Davis Vantage Pro 2 installed in May 2008 and situated in a suburban back garden in Teignmouth, Devon. The photo on the right shows the station shortly after installation. Data is transmitted every few seconds (from the small white box centre right in the photo) to a receiving console situated indoors. The data is then sent via a small modem to a PC where it is uploaded to this website every 10 minutes. The World Meteorological Organization (WMO) agreed standard for the height of thermometers is 1.25 - 2m (4ft 1in - 6ft 7in) above ground level in a white louvered screen. The Teignmouth thermometers are approximately 1.9m above ground level. 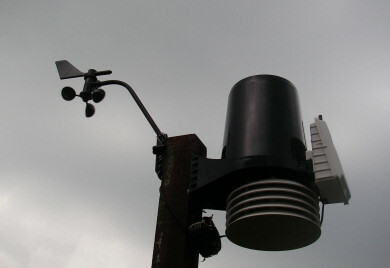 The temperature and humidity sensors are both sited in the louvered screen below the cone of the 5 inch diameter (standard size) tipping bucket rain gauge. The gauge tips every time 0.2mm of rain falls. Comments: I've been comparing the tipping bucket readings against data from a standard Met Office pattern copper rain gauge installed in open land (well as open as I can manage in a suburban back garden) and generally both agree to within 10% of one another. Ideally the anemometer should be installed at a height of 10m above ground level in an open area but at present the anemometer is situated approximately 2.2m above ground level. Exposure is far from perfect as buildings and trees in the near vicinity will affect the free flow of air in all but a NNW and SSE direction i.e. roughly following the line of the valley. If you examine the data you'll notice that for much of the time the wind is blowing from these directions for the majority of the time. Additionally a wireless Wireless Leaf & Soil Moisture/Temperature Station (Davis part no. 6345OV) was installed. The set-up included a leaf wetness sensor (part no. 6420), a soil moisture probe (part no. 6440) measuring soil moisture at a depth of 10cm, and two temperature probes (part no. 6470), one measuring the grass tip temperature and a second the soil temperature at a depth of 10cm. Firstly I sank a pole into the ground and attached the leaf wetness sensor near the top (black and gold instrument). I then secured the weather-resistant shelter below it facing south. This includes a solar panel (with back-up battery) to power the unit, various connectors for the sensors and a wireless transmitter and antenna. Its transmission range is stated as 300m line of sight and 75-150m through walls. Below this unit I attached a couple of weatherproof junction boxes within which I coiled excess cable. 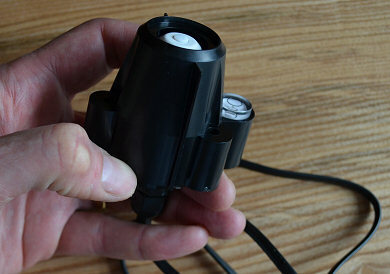 The left junction box includes cabling for the 10cm depth temperature and soil moisture sensors. You can see the black (temperature probe) and green (soil moisture probe) cables passing from the shelter into the junction box. These are then passed into some flexible conduit and buried under the ground just to protect the cable. The leaf wetness sensor (Davis part no. 6420) monitors the level of surface moisture on foliage with range from 0 (completely dry) to 15 (saturated). You can add up to 2 sensors to a single Wireless Leaf & Soil Moist/Temp station. It includes about 12m of cable. It has been placed away from trees, buildings and other structures and about 50cm above ground level. Comments: I've found this instrument to produce fascinating results. It'll detect the formation of overnight dew (values typically rising 1-2 units every 10 mins), it'll also sense fog along with rain, snow and other types of precipitation. Occasional contamination from seagulls is quickly removed! A ground frost occurs when the temperature of the tips of blades of short grass drop below 0°C. To measure ground frosts a Davis temperature probe (part no. 6470) was installed on a flat lawn away from trees, buildings and other structures. As you can see it has been carefully secured in place with a clothes peg! This keeps it in the right position and the kit can be quickly moved when the lawn is mown. Comments: Another really good instrument. It's worth securing it in place as neighbouring cats etc. can move the sensor about. Only downside is that the instrument only records to nearest 1°F or 0.6°C as the interface module can't cope with finer resolution. Real shame it's not 0.1°C. As described above the soil moisture (Davis part no. 6440) and soil temperature probe (Davis part no. 6470) cables were fed through a flexible 20mm UPVC conduit and carefully buried 10cm deep under a lawn away from any obstructions. A 20mm tee was attached to the end. The soil moisture probe was fitted into a short length of 20mm UPVC conduit and this was fed into the tee. A temperature probe was then fed via a rubber grommet into the remaining arm of the tee. Soil moisture is measured in centibars (cb). 0-10 = saturated soil, 10-30 = ground adequately wet, 30-100 = irrigation required to maintain max production, 100-200 = ground dry. Temperature probe specifications as above. Comments: Davis recommend that the soil moisture probe should be soaked overnight and dried several times before being used, so I followed these instructions and the instrument has performed very well. Enclosing the wires in conduit ensures that the thin wires are less likely to get damaged by a garden fork or (where they emerge from the ground) get snipped by garden shears or mower. I'm glad that I buried the sensor at 10cm as this is right in the middle of the grass root zone so the ground dries relatively quickly during hot summer days as the grass transpires and draws up water from the soil. I've not seen a value of 0 when the ground is saturated. After very wet weather the soil moisture reading typically dropped to around 5-8 cb for the first few months although more recently tends to only drop to 10-20cb. The Davis UV sensor (Davis part no. 6940) measures the sunburning portion of the UV spectrum. Its multi-layer filter provides a spectral response that closely matches the Erythema Action Spectrum. I've not been able to mount it on the roof yet, but it's sited 2m above ground level on a wooden post adjacent to the rain gauge. Comments: A great instrument which requires very little maintenance beyond an annual clean. Although not exposed directly to the sun from dawn to dusk, between mid-March and early October it receives direct sunlight from at least 8am to 3pm GMT and longer May - August. 9 June 2015 - The grass minimum thermometer ('soil temperature 1') was replaced as the old one had developed an intermittent fault where it was periodically recording temperatures of -67.8C! - To add a solar radiation sensor alongside the UV sensor! Because the garden is heavily overlooked particularly to the SW and W this sensor would have to me roof mounted to maximise the capture of direct solar radiation.